Camping directly at the shore. The Camping Ground offers a Meadow for about 80 to 100 tents in vicinity to the lake side. In limited amounts we like fires in the pitch on our beach and subdued guitar sound. Surely this will make your experience special. The surface of our tent area meadow consists mainly of grass and is partly shaded by large trees on a 79 meter long shoreline of Lake Constance overlooking the Island Reichenau. Naturally swimming is part of camping at the lake and that is perfectly possible either directly at the meadow or at the adjacent beach of Allensbach. The bathroom facilities are located approximately 50 meters from the tent area and feature a modern standard. In about the same distance lies our restaurant Seeküche where we offer you a varied cuisine and operate a kiosk with snacks like French Fries, Currywurst and more. Right there we support you with some small things maybe useful for your day life like charcoal, sunscreen, toothpaste and other items you sometimes forgot to pack for your trip. On our camp ground we offer a lounge room as well with a small library, a table soccer, darts, and a terrace with bean bags and a freely accessible kitchen with fridges to hire. Right next door you find our laundry facility with two tumbler machines and two washing machines available. Tokens to operate the machines you buy at the reception or the Kiosk during the opening times. Here you get the tokens for showers as well. Children use their separated showers for free. You’ll find electricity on our the tent ground. If you wish to use it please carry a CEE adapter and a camble drum along with your baggage. 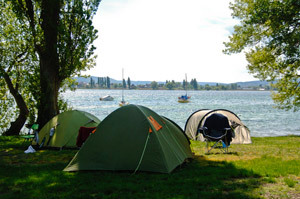 Camping at the Lake Constance alway means camping in line with the weather. 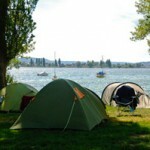 We encourage you to sufficiently secure tents positioned directly at the lake.